Lampkin (5-0 1KO 135lbs. ), who had been inactive for well over a year, appeared reserved and tight in the first round , not letting his hands go as quickly as he usually does, seemingly feeling out his opponent, trying to find his comfort zone. Maldonado (4-2 1KO 133 lbs. ), who’s remained fairly active over the past year, worked well in that round, snapping a stiff jab in his opponent’s face, keeping him on the outside and at the end of his punches. In the second round, though, Lampkin stepped up his aggression and found his timing. Using angles and a quick jab to push his way in close, Lampkin began to consistently cut down the distance between himself and his taller adversary, effectively getting inside where he opened up with rapid combinations before maneuvering out of the pocket to avoid his opponent’s counter-attacks. Throughout the remainder of the bout Lampkin controlled the range and tempo of the fight with smart boxing and measured aggression. He consistently found his mark with precise combinations in close and did a good job of avoiding most of what was thrown back. Maldonado, as is usually the case, was a game fighter, trying throughout to figure out the puzzle that Lampkin was presenting him and occasionally engaging in some good exchanges, but the difference in hand speed and skill level was evident as Lampkin hit his mark quicker and more often throughout the bout. The official tallies read 50-45, 49-46, and 49-46, unanimously giving the nod to Lampkin who secured the Northwest lightweight title with the win. It was a very successful night for the Oregon native in many respects. With the win he kept his unbeaten record intact, adding his fifth straight win, showcasing his growing skill level against a well-respected opponent. Perhaps more importantly from a marketing standpoint, though, he did so in front of a large contingent of his supporters, displaying his growing ability to draw a crowd in the Pacific Northwest. His fan-base continues to increase and it will be interesting to see if his ability to draw paying customers can be utilized to progress his promising career in an effective manner. Green hurts Arellano with a right hand bomb. 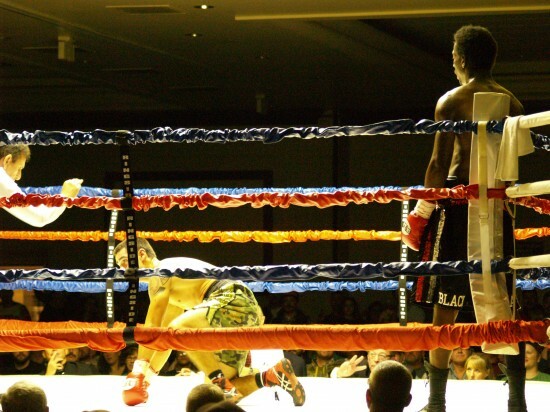 Vancouver, Washington’s Virgil “Black Mamba” Green rebounded from a controversial decision loss last September with an impressive dismantling of San Diego, California’s Israel Arellano in the third round of their Jr. Welterweight bout. Green (9-3 4KOs 139 lbs.) used a long jab from the start to set the range and quickly took control of the bout. 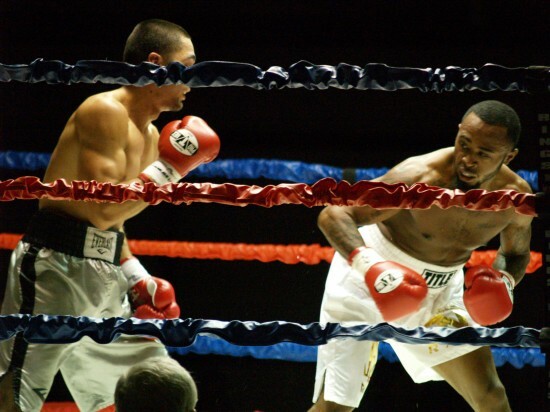 Working behind his jab, Green moved around the ring well, firing off hard straight right-left hook combinations as his opponent stepped forward. Arellano (7-4 6KOs 140 lbs. ), who is an aggressive, come forward fighter, gave Green plenty of openings to counter effectively from the outside. Mid-way through the third round a sharp counter right hand to the chin buckled the knees of Arellano. Green immediately pounced, following up with a series of vicious hooks that rocked back the head of Arellano and sent him crashing to the canvas. Arellano made it back up quickly, but he was very wobbly. Referee Ed Collantes allowed it to continue momentarily, but wisely stepped in as Green unleashed a barrage of unanswered punches along the ropes. The end came at 1:22 of the third round. Green looked impressive in this bout, fighting a very intelligent fight, using his jab and lateral movement to take control of the range and never allowing Arellano to bait him into an inside fight. There is still a lot of potential in this young fighter’s career and he is showing improvements and adjustments with each fight. 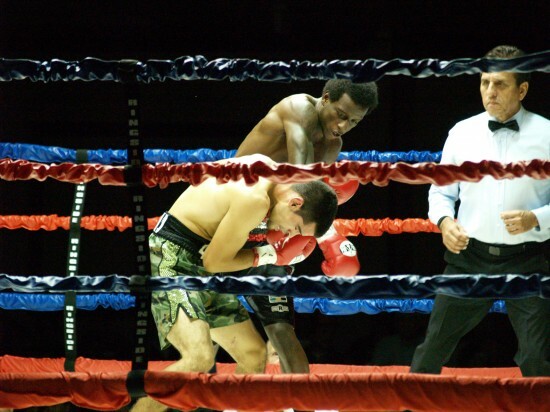 Yakima, Washington’s Andres Reyes had to deal with some early pro debut jitters and overcome an early knockdown to secure his first win as a professional prize fighter against eight fight veteran Marcos Cardenas. Reyes (1-0 133.5 lbs) pressed the fight early in the first round, unloading with hard power shots, but his attack began to get wild as the round wore on. Cardenas (4-5 1KO 133.5 lbs. ), who is a fighter known to keep his cool in a wild fight, exploited his opponent’s aggression mid-way thorough the round, countering a looping left with a hard overhand right to the chin, sending Reyes down to one knee. Reyes made it up fairly quickly and did not seem too hurt by the punch, but the point had been made that Cardenas was not going to be an easy mark. As Cardenas began to come on late in the round, Reyes stood his ground, trading in a wild back-and forth exchange, giving fans an exciting end to the round. In the second round Reyes came out with a more measured approach. He still maintained a busy work-rate, but he didn’t get wild and used his angles well to avoid Cardenas’ counters. Repeatedly Reyes cornered his opponent and unloaded with hard hooks to the head and body before pivoting away. Reyes gradually increased his tempo as the fight wore on and hurt his opponent in the third with a hard right hand. The remainder of the fight was exciting with both fighters throwing a lot of leather, but Reyes had the edge with his relentless and busy attack. One judge scored the bout for Cardenas 38-37, with the other two giving it to Reyes via scores of 38-37. 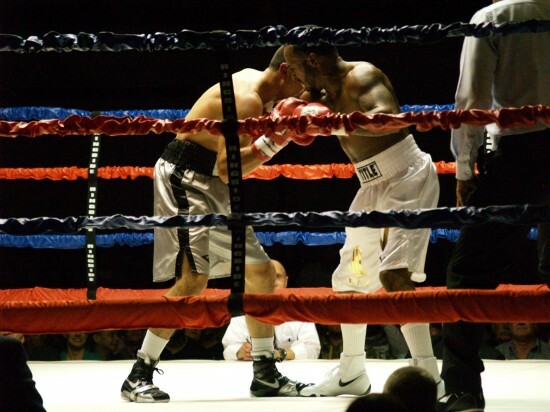 Reyes impressed many at ringside by claiming a win over a skilled and experienced opponent in his professional debut. He is certainly one to keep an eye on as he continues his career. In a surprisingly easy victory, Claudia Gutierrez dominated former world champion Kelsie Jeffries in a six round women’s Jr.featherweight bout. The two had fought once before almost two years ago in a close bout that was scored a majority draw. This time around Gutierrez (4-1-1 120.5 lbs.) wasted no time setting the pace and taking control early. Using a stiff jab Gutierrez, who was clearly the stronger fighter, rushed her way in close and began to unload with heavy punches. She quickly put Jeffries (41-11-2 4KOs 119 lbs.) on the defensive with hard jabs and quick follow-up right hands, pressing forward with a consistently aggressive attack. She maintained that pace for most of the fight, controlling the rounds with effective pressure. While Jeffries tried to get something going for herself, she seemed to have no answer for the violent attack of her opponent, being forced into a defensive posture for most of the fight. By the end of the bout she was bruised and bleeding from her right eye. All three judges scored the fight for Gutierrez with scores of 60-54, 59-55, and 59-55. In a light heavyweight match-up between two fighters making their pro debut’s, Medford, Oregon’s Rafael Valencia stopped Salem, Oregon’s Abelino Morales in the third round. The two fighters fought on fairly even terms for the first two rounds, stepping in close and slugging away in a very entertaining fight. In the third, though, Valencia began to land at a more consistent rate. Half-way through the round a heavy overhand right buckled the knees of Morales. Valencia wasted no time, pressing forward and capitalizing on the opportunity, unloading with a vicious assault along the ropes. After a number of hard shots went unanswered, referee Joel Schoebe mercifully stepped in and waved it off, awarding Valencia the TKO at 1:39 of the third round. Seattle, Washington’s Zach Cooper (2-0-2 2KOs 147 lbs.) and Nigerian Olympian Rasheed Lawai (0-0-1 144 lbs.) fought to a four round majority draw in their welterweight bout. Cooper had a tough time early on figuring out the long and rangy style of Lawai, who was able to box effectively in the first two rounds with a precise right jab out of a southpaw stance, hard counter lefts, and quick lateral movement. In the third, though, Cooper appeared to kick it into gear and began to barrel his way in close, smothering his opponent’s punches and landing hard shots to the head and body. He kept the momentum going in the fourth, outworking Lawai in close with a constant attack. At the end of the bout one judge scored for Lawai 39-37, with the other two scoring the bout 38-38. In the evenings’ opening match, Salem, Oregon’s Josh Frias (1-0 128 lbs.) made his entrance into the professional fight game a successful one with a four round unanimous decision victory over fellow first time entrant Andres Martinez (0-1 128.5 lbs. ), of Sacramento, California. Frias used a consistent attack to maintain pressure on his opponent, who seemed more comfortable when allowed to box. His busy work-rate and constant forward movement kept Martinez on the defensive for much of the fight. While Martinez was a game fighter and managed to have an effective run in the second, the majority of the action was controlled by Frias. The official judges’ tallies read 40-35, 39-36, and 39-36 all for Frias. It was another successful show for promoter Patrick Ortiz and the Seven Feathers Casino with some well-matched and exciting fights that left the near capacity crowd buzzing from another a great night at the fights.